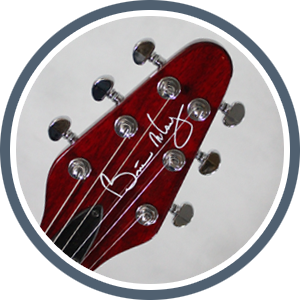 Since the launch of the original, super-affordable Brian May Guitars Special, the unique configuration of Brian's original instrument has become available to musicians all over the World. Consequently, House Music has fielded a wealth of questions regarding the Brian May Guitars range - everything from set-up, maintenance and switch orientation to the various amplifiers and effects units that Brian employs to achieve his distinctive sound. Here is a guide to the principal features of the BMG Special that we trust will help you well on the way to gettting the very best from your instrument in any performance environment. The general information here on pickup configuration, switch settings and set-up also applies to the more faithfully accurate BMG SUPER model. 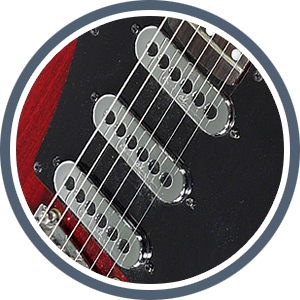 Another great source of information is the RED SPECIAL FORUM, a lively, sometimes controversial, community group whose members share news, advice and opinion on a dizzying array of topics from sounds, set-ups, pickups and amps to repairs, replacement parts and conversions. The BMG Special features three BM brand Tri-Sonic style single-coil pickups. These are modern replicas of the Burns Tri-Sonics that Brian and his father installed on the Red Special and, whilst there are some technical differences (their impedance is noticeably higher) they produce a faithfully accurate reproduction of the original tone. First developed for use on Ormston Burns guitars in 1960, The term "Tri-Sonic" derives from the fact that the unit picks up sound from three points - the top and both sides - meaning that the vibration of the strings is sampled from a longer than usual length. In combination with the orientation of their isotropic ceramic magnets and the unique manner in which the coils are wound, such pickups produce a distinctive “big, round sound” with a richer harmonic content than any conventionally wound pickup. The three pickups are wired in series for increased output and a fuller signal. When more than one pickup is active the resultant tone is more akin to that of a humbucker, with considerably more warmth and gain than a traditional parallel wired single-coil arrangement. In addition, the middle pickup is reverse wound and reverse polarity (RWRP), emulating the configuration employed by Brian and his father. The pickup's magnetic pole is reversed and its coils physically wound in the opposite direction compared to the other pickups. Hence, when the middle pickup is selected in combination with either or both of the other pickups in phase, a hum-cancelling effect is created, reducing noise and hum in the output of the guitar. In combination with the phase switching system employed on The BMG Special, the sound of the selected pickups can be tailored to produce an incredible variety of tones. Use of the volume and tone controls also allows for subtle colouring of the response. The BMG Special and Super models both feature two banks of three switches which control the pickups, with the orientation of the switches matching the pickup location as shown in the diagram right. Each pickup has its own dedicated switch... DOWN is ON, UP is OFF. Just one of the tricks that maximizes the incredible versatility of the BMG Special, this switching system allows for pickup combinations of "ALL 3 PICKUPS ON" and "NECK + BRIDGE PICKUP", configurations not available on other, more conventional three pickup instruments. It also provides a true stand-by option, handy for both stage and studio performance. Simply flick all three switches to the UP/OFF position to silence the instrument's output signal. The bottom bank of switches controls the phase of the signal from each pickup. Engaging the switch reverses the phase of each pickup individually, allowing the pickups to be either IN PHASE or OUT OF PHASE relative to each other. in any pickup combination. When two pickups are selected and in phase, their signals work together and sonically reinforce each other with the resultant output louder than either pickup on their own. When they’re out of phase, they work against one another, cancelling many frequencies. The resulting tone is the “leftovers” from these cancellations, typically rich in mid to high frequencies with the low frequencies reduced, giving the sound a characteristic thin, sharp quality. Note that it is the reversal of the phase of two pickups RELATIVE to each other that yields the In phase or out of phase effect. For example, with the bridge and middle pickups active: sliding BOTH phase switches to either the UP or DOWN position will put the pickups in phase and produce the same, full sound favoured by Brian for much of his rhythm guitar work. Sliding the bridge pickup phase switch DOWN and the middle pickup phase switch UP will produce a thinner, out of phase tone. If the positions of the phase switches are reversed, the out of phase output will identical. Reversing the phase of a soloed, single pickup will have no audible result - e.g. the bridge pickup by itself will sound exactly the same regardless of the position of its phase switch. Although the six switches ostensibly provide twenty-one different pickup/phase combinations, there is a degree of redundancy due to the fact that some settings produce identical results as explained above. Of course, that still leaves an abundance of 13 possible unique combinations (14 if you include the "kill-switch" function), making The BMG Special a extremely versatile and powerful creative instrument. The unique nature of its pickups and wiring scheme provide the BMG Special with an awesome arsenal of tonal possibilities and the real fun of this instrument is exploring the different configurations for yourself but, just to give you a brief, introductory “tone tour”. Plugged in, with a clean amp tone, the bridge pickup alone is pleasantly thin and quite Strat-like. The middle pickup is louder and fatter with a good crisp attack, with the neck pickup comparable in volume to the middle, but with a fuller low end and a softer attack. As you combine pickups, in phase, the overall volume increases. Adding the middle to the bridge adds power and knocks off some top end, while neck plus bridge equals a warmer, more powerful Strat-type mix. Middle and neck create a thick, semi-solid jazz style voice. Activating the phase reverse switches typically lends a thinner, sharper tone to a dual pickup mix but, with three pickups on, you can experiment with different phase combinations to sometimes subtle and often rather dramatic effect. For example, all three pickups on produces that thick creamy tone that has been used for the cello sections of Brian May's guitar orchestrations. However, reverse the phase of the middle pickup and the bottom drops out, leaving you with an agressive, snarling Telecaster or Gretsch-like twang. Cranked up, the guitar is very resonant and the out of phase tones really begin to make sense in such an environment, adding a cutting harmonic edge, with Brian's most used tone - bridge and middle pickup in phase - certainly replicating a modern middle-heavy humbucker. Take a listen to the guitar solo on "Bohemian Rhapsody"... that crying guitar tone is created by having the neck and the middle pickups in series and out-of-phase... and then driving the hell out of the amplifier! The current BMG Special features Trevor Wilkinson's WVP "Wave" Knife Edge Tremolo, its strikingly modern design offering one of the smoothest actions of any fulcrum vibrato currently available. With a sleek, low-profile surround restricting the sideways movement of the solid brass saddles, the WVP offers superior comfort, stability and performance. Features include a stamped steel, heat hardened top plate, 6-screw pivot mounting and a solid steel sustain block with "stagger-drilled" string holes to make corrections to the intonation a relatively simple job, without putting too much stress on the saddles. As with all steel blocks, it helps magnify the overall sustain, brightness and top end, resulting in a more expansive, sharper tone. 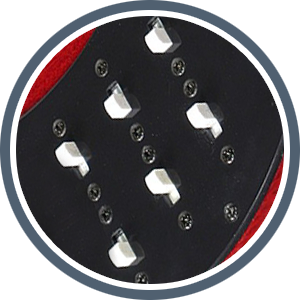 The custom, BM-style push-in tremolo arm is secured by a clamping bush inside the block, which can be tightened to taste by a small bolt on the rear of the block. The thread-less design means that the arm can be positioned at any orientation without interference. 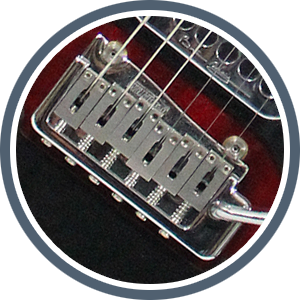 With the tremolo bar placed in the tremolo unit, rotate the arm so that it runs parallel to the neck, with its end pointing at the headstock of the guitar. 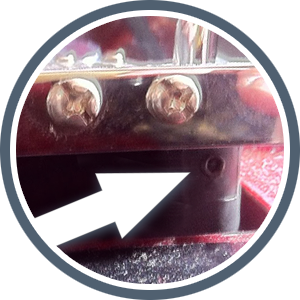 Depress the tremolo arm downwards, towards the guitar's body - this will raise up the back of the tremolo block, exposing the small grub screw which locks the tremolo arm in place . Use the smallest of the allen keys supplied with your BMG Special to tighten the screw to secure the tremolo arm with the desired freedom of movement. The BMG Special is equipped with Grover 406 Mini-Locking Rotomatic Tuners, making re-stringing a breeze and ensuring rock-solid tuning stability, even with lots of vibrato and string bends. These superb, machine heads feature compact metal knobs with adjustable tension, an 18:1 gear ratio for fine tuning, lifetime sealed lubrication and Grover's ingenious Internal "Locking Cam" string post that automatically locks the strings as you tune. You'll need fewer string wraps, change strings faster, and your tremolo will have more accurate return-to-pitch. Turn the tip of the string post until it clicks into place. This will align the string post holes. Note that the string hole is off centre. Turn the tuner to rotate the post until the string hole is positioned away from the machine head, in line with the neck. Thread the entire length of the string up through the bottom of the hole and pull to tension by hand. Holding the end of the string, begin tuning. At first, only the inner Locking Cam in the string post will turn. Once the string is securely locked, the outer post will turn. Tune string to pitch... In under one string post revolution, you'll be in tune. And you'll stay in tune! Snip the end of the string. Greg Fryer has provided this information as a general guide to the best way to set up your BMG Special or Super to give the best interpretation of Brian's. Here's the long "too much information" answer - bear with me because this info might help you to understand the other sorts of things that often need to be done when setting up string and pickup heights - but if you're experienced in guitar setting up, go straight to the measurements at the bottom! The pickup heights are generally the last item to be adjusted when a guitar is being set up by a professional repairer - many of the other things that I mention below may need to be adjusted in order to get your guitar playing well so that you can then set up your string and pickup heights - otherwise you might end up saying; "Brian sets his strings at 2.0mm/1.5mm but when I do the same, it sounds buzzy and terrible like I'm playing a sitar"
There are many things that you can adjust and repair yourself on your guitar and your ability will be dramatically helped if you bone up on the subject and buy tutorial books/DVDs etc from people like Stewart MacDonald in USA (they also have a lot of good free info on their website www.stew-mac.com and there is other good stuff out there on the net). If you can develop a good feel for it, you can end up doing a very good quality job. It's always a good idea at some point to take your guitar to an experienced guitar repairer for an overall checkup on whether your guitar might need more serious work like fret dressing/levelling and changes in zero fret height, recutting of nut slots or the making of a new nut (the Graph Tech nut material is excellent for low friction which is important on any tremolo system), or even re-fretting and re-shaping the surface of the fingerboard (serious stuff and costly but more commonly needed than you'd think), and some of these things might need to be done so that you can THEN best set up the height of the strings to get the guitar playing well so that you can then lastly set up the pickup heights. OK, hopefully your guitar won't need any of those things, but I'm saying all that first because in nearly 30 years of guitar making/repairing, I've rarely if ever seen just a so-called "simple job" - if you want a great result it ALWAYS seems to be more complex than you first expect - so keep your fingers crossed, persevere, and know where your starting point was so you can always come back to it (i.e. write down how things are adjusted/set before you plunge in and begin!). The rule of thumb is therefore... fine tune the techniques outlined below to suit what you think sounds and responds to your playing style best. (Or whatever pitch and tuning you're using). By measuring at the 12th fret - this measurement is from the top of the fret "crown" to the underneath of the string. Set the rest of the strings so that they "flow" evenly in height from 2.0mm to 1.5mm as they go across from the bottom E to the top E.
Suit yourself here to what looks and feels right for you - loads of guitars that I've repaired over the years didn't have very good fretwork (uneven to begin with or worn with playing etc) or consistently well made necks, and this limits what a repairer can achieve when setting up a guitar's action... if in doubt, blame the manufacturer of course! An optional stage - again, see web info if you don't already know what to aim for. It can be handy as a reference to fret both the Top E and Bottom E strings at the 24th fret and to measure the gap down to the pickup - this works fine with the Neck and Middle pickups but is less meaningful at the Bridge pickup. 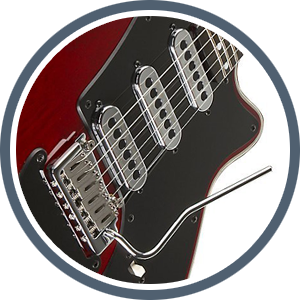 Please bear in mind that these measurements are optimised to suit the original pickups on Brian May's Red Special, Adrian Turner's Adeson replica spec pickups (as featured on the BMG Super) and the BMG branded pickups on the BMG Special. They might not suit the pickups on your guitar or those Tri-Sonics that have more powerful an-isotropic, ferrite magnets like those on the Korean made Burns BM Signature guitar or Kent Armstrong models. As usual, depending on the instrument and your playing style, the rule of thumb is to fine tune to suit what you think sounds best! Current BMG Special models bear a unique BHM prefixed 5 or 6 digit serial number located on the reverse of the headstock. Some Specials produced before 2010, including the first generation BMG Special (the so-called "Transition" Model) and the Mk. 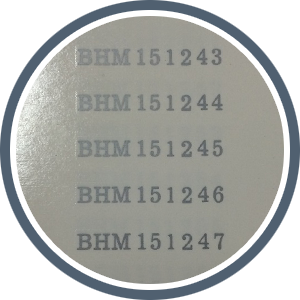 2 revision (c. 2006-2008) have a 4 or 5 digit serial number sequence where the FIRST digit refers to the year of production. 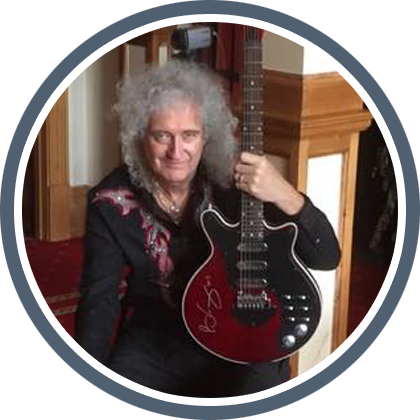 We often get asked how to protect Brian May's precious autograph on the Signature Edition Specials, Mini Mays and Rhapsody guitars purchased through one of our exclusive signed guitar promotions. Brian uses a Sharpie® brand metallic paint marker to sign, the oil based ink being particularly resistant to water damage, abrasion and fading. Other than ensuring that it not exposed to direct sunlight for prolonged periods, there should be no need to protect the signature if the guitar has been purchased for display purposes. However, being signed on the body's upper bout, the signature will almost certainly wear off over time during playing. To prevent this, there are two options we suggest. Get some good quality clear self adhesive film and apply this over the signed area, with all corners rounded so there are no sharp corners where the film can start to peel off with playing. Apply a clear lacquer encapsulating coat on the top of the guitar... we strongly recommend that this is carried out by a respected professional.